Cp*-beryllocene. ELF analysis. Click for 3D. The crystal structure of (nonamethyl)bis-cyclopentadienyl beryllium  illustrates the octet rule directly. Be is ionised to Be2+, the charge balanced by two cyclopentadienyl anions. The octet is formally filled by donation of six electrons from one Cp* anion, and only two from the other, filling the s and p shells of the metal (the 1 and 3 in the sum alluded to earlier). The ELF analysis suggests the molecule is less ionic than ferrocene. ELF disynaptic basis are located for all five Be-C bonds on the η-5 ring, and only one for the η-1 ring. The latter basin contains 1.87 electrons (a conventional electron pair bond), whilst the five former range range from 0.57 to 0.68 electrons, adding to 5.02. 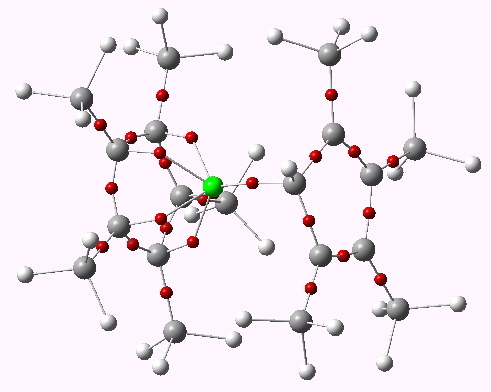 The formal octet is thus not entirely filled, but in this sense, it is less ionic than ferrocene. (See DOI 10042/to-8371 for details of the calculation). Uranocene is a rather different beast. The ligands are not cyclopentadienyl, but cyclo-octatetraenyl. Uranium has a radon core, and a 5f3, 6d1 and 7s2 valence shell(s) electron configuration. Ionised to U4+, formally the 5f, 6d and 7p shells are all empty; a total of 14 + 10 + 6 electrons would be required to achieve a 32-electron filled shell , or 30 additional electrons. The two COT ligands, as di-anions (achieving aromaticity) could provide only 20. So uranocene (Cambridge refcode URACEN10, DOI 10.1021/ic50111a034) is far from the holy-grail of a 32-electron complete molecule. The QTAIM analysis of the electron density (the molecule itself is a triplet spin state) shows only six bonds from each COT ligand to the metal. The ELF analysis shows NO U-C disynaptic basins, unlike either beryllocene or ferrocene (the features surrounding the U derive from pseudopotential used for the calculation). This indicates that uranocene is the most ionic of the three metallocenes. Could a molecule be contrived that might achieve (a formal) 32-electron filled 5f,6d,7p valence shell? One would probably need a ligand contributing 14 rather than 10 electrons whilst keeping the size of the ring manageable, quite a challenge. 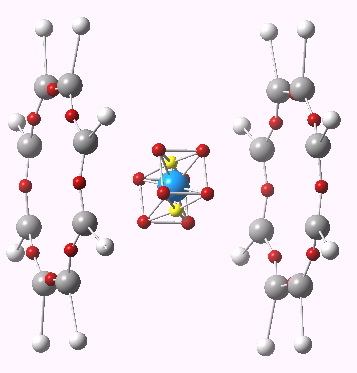 There may not be enough space for three 10-electron ligands. So, no examples of 32-electron metallocenes just yet then! This entry was posted on Monday, April 25th, 2011 at 8:19 am and is filed under Interesting chemistry. You can follow any responses to this entry through the RSS 2.0 feed. You can leave a response, or trackback from your own site. Incidentally, we’ve had good results using the SARC basis sets for topological analysis of actinide compounds rather than than the ANO-RCC basis sets or pseudopotentials – they’re segmented and of a fairly reasonable size, so you can use them pretty speedily in Gaussian. Thanks Ian. I have incorporated your suggestion of a SARC basis into the next post. The interesting feature of berylocene is its extreme fluxionality (see JACS 1978, 100, 5695 for my very early paper with Streitwieser and Schaefer). As I recall, the ionic magnesocene prefers a symmetrical sandwich structure. Yes, as systems with a lot of ionic character, they can easily adopt different coordinations. Thus beryllocene I believe has a (calculated) D5 symmetric structure which in fact is not a lot higher in energy than the asymmetric one noted here. Magnesocene has its own version of an 8-electron rule. With each cyclopentadienyl anion moiety contributing six electrons it looks like a covalent structure would have 12 electrons around magnesium (the compound is strongly but not completely ionic). But if you look at orbital symmetries you find that two of the occupied cyclopentadienyl ring orbitals have no overlap with Mg and are essentially nonbonding to the bridge. Thus Mg has only eight valence electrons after all. Beryllocene, however, cannot hold this sandwich structure. 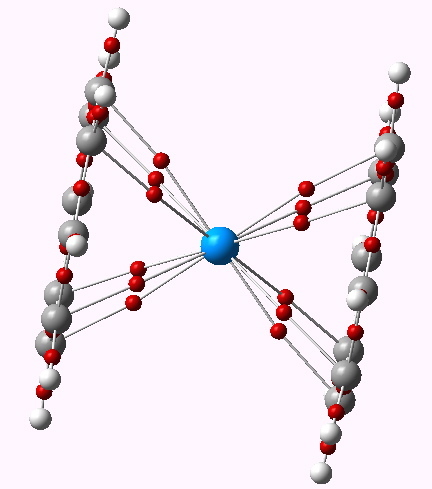 The bridge-“nonbonding” ring orbitals described above become significantly antibonding within the bridge if they are brought too close together, and Be unlike Mg is too small to prevent this. Beryllocene therefore is prone to have a ring slip out of the sandwich ro relieve this antibonding interaction … even at the cost of aromaticity in the slipped ring!